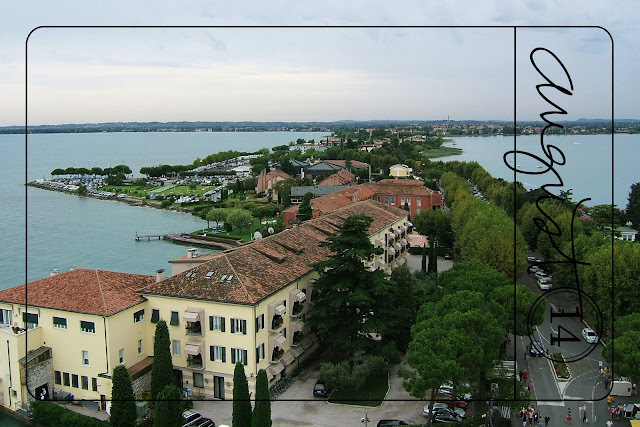 On August 14th we took the bus to Sirmione, which is situated on the end of a peninsula that reaches right into Lake Garda - this photo is taken looking back south over the connecting spit of land. When we got there we found a little stall selling fresh fruit and coconut kept cool in a water fountain - we had to try some of the coconut! I've been following your trip in my atlas .. off to see where this next beautiful place is! this is a really fab trip Mel! Did it take very long to drive to see all of these places from a base or did you stay in each place? I'd love to do this trip!! And what did you think of the coconut? I reckon it's one of those things that isn't half as nice as it looks. Dessicated coconut, now thats a different story. Sian: there's a photo in this afternoon's post which may well answer your question!! Oh Mel, it's gorgeous!! So jealous!! I love the photo of Sirmione. Just beautiful. You have so many gorgeous photos to scrap!